It was merely an effort to show that the bear is doing better than people are led to believe. We can agree to disagree. I think for one thing, there are other creatures with a much worse situation than the polar bear, yet nothing is ever said about them. Lions, for example. Over 70% of sub Saharan populations have disappeared in the last two decades. The Indian lion has a population of only around 400, all in the Gir Forest. Plans are to establish another population, but the area chosen contains Bengal tigers, which being endangered themselves, would constitute a threat to the lions, as the tigers are bigger and more powerful and could kill the lions, if met in a one on one scenario. Nobody claimed he is/was. He is a science communicator and it's literally his job to explain this type of stuff. Nearly every science is complex and takes years of study and many scientists don't communicate their jobs to the public very well because they are used to working along side others knowledgeable in that particular field. Hence why we have science communicators, to take the knowledge of a scientific field and convert it so that a layman can understand it and hopefully enjoy it. He has the backing of the science community and a resume to back it up as well. I referenced Mr. Nye only to point out a common theme I've been noticing. The most common CC denier argument I hear is that "the planet goes through patterns, etc... It's all natural." This statement is generally said because either the person has no clue what they are talking about or they are don't understand that the rate of the change is the real threat. This was very obvious in the Nye discussion with Tucker, he couldn't get Tucker to fully understand the rate of change is what's important. Last edited by JNort; 02-04-2019 at 02:43 PM. Or maybe some of us simply do not believe every single thing we're told. Some of these assertions, like eating beef causes GW are simply hard to swallow by rational thinking people. But, it appears you've done much research on the subject, so I will look into some of these facts you present. I found that chart really surprising the first time I saw it. Definitely worth a look to understand what kind of temperature changes we're talking about. XKCD has actually hit on this a few times. I really like this one. And how is not eating meat going to halt the rise of temps? So a lot goes into the equation, but currently the biomass of cattle on earth is about the same as humans. Cows are ruminants and they produce a lot of methane through their burps and farts. Methane is a greenhouse gas about 30x more potent than CO2. Humans produce methane too, but because we are not ruminants, we don't produce the same amount. So reducing the sheer number of cows because we don't eat them would have a significant effect on the amount of greenhouse gases, which we know warms the Earth. 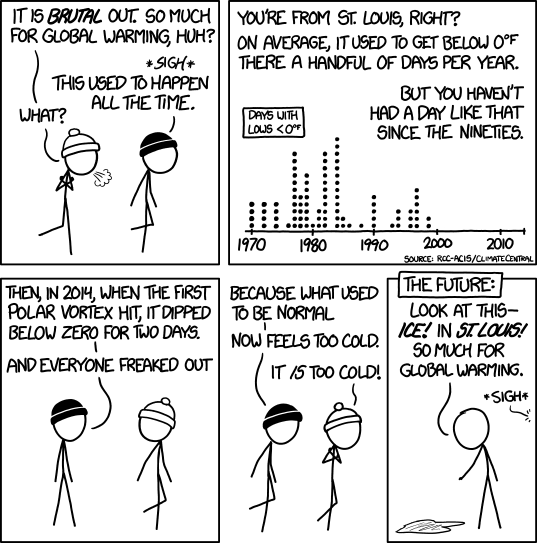 Please look at the XKCD visualization. I don't know if you're intentionally trying to insult people here, but accepting the mountains of science on climate change and global warming is absolutely the mark of a"rational thinking" person. I have a standard question for people having trouble accepting the science behind climate change. Here it is: finite differences or finite elements? Thanks for being open to our arguments. Regarding your post about lions, I definitely agree that climate change is far from the only threat to endangered species. You seem pretty knowledgeable about animal habitats so perhaps, in the spirit of the original post in this thread, it would be more productive for us to focus on ways you think we could protect those species from these other environmental dangers? Okay, since you have decided to be the person who is skewering this thread originally intended for "ways to reduce human impact on climate change" by being the resident skeptic, despite lots of people saying over and over "this thread isn't intended to be political or to debate the (mostly decided) issue of whether it is real..."
Human impact on climate change is real. Human impact on climate change isn't real. What's gained by arguing (in the face of a MASSIVE majority of scientific evidence) that we ought not make efforts to reduce our impact on the environment? Is it just too inconvenient? That's really the only explanation that makes sense? I suppose you could say it's "expensive," but many many other countries have proven that "going green" can be a huge boost to the economy, creating real jobs, lessening impact on the environment, and simply being safer than most other options. The only people that "going green" is expensive for is people with vested economic interests in fossil fuels. If you are one of those people, then, okay, I suppose I hear your hesitance to make a shift. But, you also have to be realistic and recognize the finite nature of said resources. Oil will run out. Coal will run out. Natural gas will run out. I just have a real problem understanding what the motivations is behind saying crossing your arms and shaking your head as the Outer Banks of NC start shifting and disappearing - they are an awful lot closer than your polar bears or your lions. If you feel eating meat is your god given right and you want to drive your Hummer at 90 miles per hour and 5 miles per gallon, go for it. Have a blast. But why on earth sully this thread of people who are trying to be helpful and proactive? More habitat needs to be set aside for them, first and foremost. And nations need to protect those boundaries. People need to stop trashing our wetlands and waterways. Many birds and other creatures die every year from discarded plastic and styrofoam, and lead weights and bird shot are ingested and poison migratory waterfowl. I do applaud your attention to the waterways. That's also quite crucial. Can we reduce the number by eating them but not replacing them? Is there a source that provides information on how environmentally responsible various companies are? I already try to limit purchases from China - trade balance and their poor environmental situation are the main reasons. Are there other countries we should avoid for these reasons? Looking for additional things an individual can do to reduce their impact on the environment and global resources. This is effectively, Pascal's Wager with the world instead of your eternal soul. a. What does it cost you if it is real and you do nothing? b. What does it cost you if it is a hoax and you try and reduce your environmental impact? Personally, I fall on the side of there are a lot of things I can be doing because they make sense. I hope they also help make the world a better place. Sadly, I haven't talked Mrs. PackMan97 into solar panels :/ ...yet. Awesome. It's clear you're doing more to help the environment than most, despite your skepticism about the science. This fits right in with the idea from the cartoon jnort referenced and I tried to link. What if it's all a big hoax and we create a better world for nothing? Even if we don't agree on the validity of science, we should agree that having a clean environment benefits us all. I could write a book on jet aircraft but that does not make me a pilot..Nye once actually claimed not to be a scientist, but rather a science advocate. I could write a book on jet aircraft too, but no one would read it because I wouldn't know what I'm talking about. My issue is that the "Bill Nye is not a scientist" view is that it dismisses his decades science based knowledge as no more (or less) valid than anyone else's non-scientific opinions. I'm OK with referring him a Science Teacher or Science advocate, and think calling him a scientist is a lot closer to the truth than "not a scientist." I'm not OK with simply dismissing him as a TV actor/comedian. I also think we should be careful not to discount those who spend their careers teaching and advocating for science as uninformed simply because they don't work in a lab. So apologies if any of what I have said comes across as overly aggressive or passionate. I would like to (after responding to the quote below) find out what it would in fact take to possibly change your mind and also give one or two issues at a time that you think aren't that convincing with what you hear about CC so that we can perhaps bridge this divide. Or maybe some of us simply do not believe every single thing we're told. Which is a healthy practice. However it does get to a point when it's seemingly ridiculous to keep turning cheek to the evidence presented. You could always go test one or two of the experiments out yourself. The only other alternative I can think of would be some grand conspiracy that involves paying off 98% of scientists across multiple fields of study, and involving dozens of different nations to cooperate while never leaking any of this info for 40+ years. Seems to me it's more plausible that the 2% are in that category where it just so happens most of those 2% are backed by special interests groups. Think Robert Kehoe who fought to keep lead in commercial products. Some of these assertions, like eating beef causes GW are simply hard to swallow by rational thinking people. Who asserted beef causes CC? It's a contributing factor sure but it was brought up only to help with the original question of what can we do to help as far as our daily lives. Heck I eat a crazy amount of meat but would like to cut back and I have on beef in particular. "Rational thinking people" would, at least I would hope understand that there are experts out there who understand and know this stuff plus it gets peer reviewed. A "rational thinking" person would either do more to understand it themselves or allow the experts to make the calls. But, it appears you've done much research on the subject, so I will look into some of these facts you present. That link lists the 25 most common anti climate change arguments and the rebuttal. It's a great tool even if just to realize why some people get so fed up with certain talking points. My opinion is when you are looking for beef, go local. And that goes for everything, including vegetables and eggs, chickens, cheese. Find a farmer's market where they have to be from a 100 mile radius. Find a real local butcher with local beef or even one who grows their own beef. Support farm to table restaurants.But cut back on beef and meat. It's healthier. Grass fed beef is so good. I think I could fall into that last group. We do a Teach a Kid To Fish clinic every year at High Point City Lake. I started the program 13 years ago, and it has become the model for other similar events across the state. NCWRC sends biologists every year to grade the event, and we always come in at 100%. My part in the event is to teach the children local fish and wildlife identification, and how to be good stewards of the environment. They are taught to clean up after themselves after a day in the outdoors, even to pick up after others who may be careless. I also did work with the Red Wolf Recovery Project, and helped out in a survey to protect the eastern diamondback rattlesnake, which is extremely rare in NC. I hiked and kayaked for miles in eastern NC, and am proud to say we located 13 of these snakes. So I would say I am trying to help the natural world. Put me firmly in the "let's shut this sucker down" camp. Now I'm sure I'll be flamed for that opinion, just as I was the last time I expressed it regarding what would normally be a PPB thread (although I was proven right about ten minutes later for that one). Let me offer two reasons in support of my view. First, this thread is not just a discussion of science, or of the efficacy of certain private actions in their effects on environment or climate. It's explicitly a public policy thread starting with the first post, as soon as fuse mentioned "[lobbying] your municipal government." Second is a more general point about the nature of explicitly or borderline-PPB board discussions. Many comments contain embedded assumptions that do not appear "PPB" for one who doesn't challenge them, but for anyone who would - whether on the basis of fact, or opinion/values - the form of the challenge in a reply will appear as being obviously PPB/against forum rules. As a brief example, let me offer (an abbreviated version of ) a challenge to the "98%" consensus figure that is often cited and misrepresented. The origin of the figure is a pair of papers by John Cook. The 97% figure is a fraud, and you can verify that using his publicly available paper and his publicly available data for the survey responses. It takes about ten minutes do so, and only requires a computer and the ability to do some basic arithmetic. If you want links or page numbers or anything, PM me and I'll reply later. That is a challenge on a verifiable point of fact, but where do you think the discussion would go from here, if I pursued that point or ones like it? I have to wonder how pre-registered predictions of my views on the subject, colored by that challenge, would compare to my actual views. This post is the only one I'll make in the thread. I do think the DBR community has interesting things to discuss on the topic, and I think it's possible to have PPB-adjacent threads that are within the rules. I don't think they're adjacent when policy is brought up in the first post. This thread has already proven it cannot avoid partisan discussion. Amazing that we can manage to have civil discussion about presidential elections, but not about a science issue. So we're going to have a (still ongoing) 2018 Midterms thread, a 2020 Presidential thread, a thread for Brexit, and now this. Didn't I propose just bringing back the PPB forum like a year or so ago? How is this thread different from any you would find on a politics board? Everything seems so familiar. IMO, we should just have the same rules as we have for any other thread. If the topic isn't something you're into, that's fine, but maybe just avoid the thread. It's like people going out of their way to post in baseball threads about how boring they find the sport.